Saturday, December 8, Departure at 8 a.m.
We visit Rhinebeck, one of the most historic and quaint towns up the Hudson River two hours from Manhattan. It began as a Dutch settle-ment on land purchased from the Iroquois in 1686. The tour includes a lecture on the town’s history (a Continental Army regiment trained here) as well as a short walking tour and site visits. 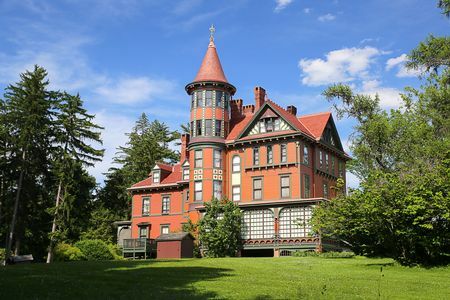 The grandest of these sites is nearby Wilderstein, an 1852 Queen Anne mansion of three stories with a five-story tower. We will also visit the Church of the Messiah, which has Tiffany stained glass windows, and Delamater House, an example of American Gothic by architect A. J. Davis. A private luncheon will be served at the Beekman Arms, alleged to be the oldest functioning inn in America (1766). All building sites and town shops will be charmingly decorated for the holidays. This bus tour is limited to 30 participants. Paid reservations must be received by Friday, November 30.